Xbox 360 and PlayStation 3 gamers who have been a little disgruntled with a number of glitches and bugs found within the new Assassin’s Creed 3 game. 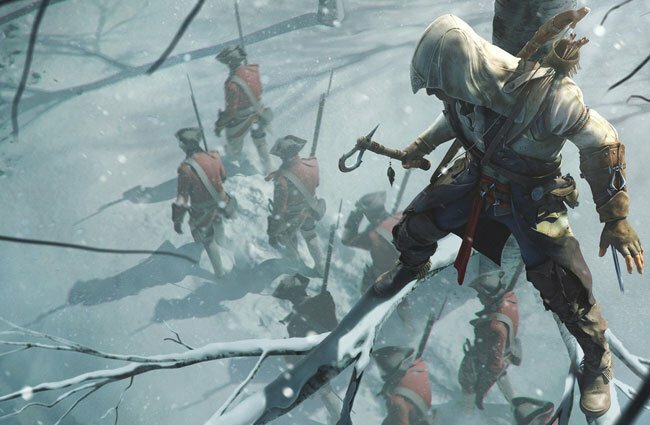 We’ll be pleased to learn that Ubisoft has announced that a huge patch is currently being finalised for release for the new is expected to go live Assassin’s Creed 3 on PlayStation 3 and Xbox 360. The Assassin’s Creed 3 patch for both PlayStation 3 and Xbox 360 consoles “by the end of next week”, Ubisoft explained the Assassin’s Creed 3 official forum. ASSASSINATE Instances where it was possible for players to kill players that were not their target in Assassinate have been corrected. ASSASSINATE Bodyguards no longer fail to stun when they are locked by the pursuer of the player they protect. In Fort Wolcott, fixed a bug where players would remained stuck on warmup screen. The cooldown boosts for loss streak bonus are not permanently active for all abilities during a manhunt round anymore. Mission “A DEADLY PERFORMANCE” Players could be stuck in the opera if they backtracked in a certain way after killing the target. Mission “INFILTRATING SOUTHGATE” Fixed multiple bugs where the guard on the boat could walk in circles, stay stuck or jump on the railing. Mission “JOHNSON’S ERRAND” Fixed floating muskets after a cinematic. Mission “JOHNSON’S ERRAND” Moved HUD icon on the explosive barrel on the ground instead of above the cart, because that’s what the player needs to shoot. Mission “JOHNSON’S ERRAND” prevent the player from using hide spots during part the mission to avoid a possible mission break. Mission “THE SOLDIER” Fixed a missing audio line. Mission “THE SURGEON” Fixed a bug where the eavesdropping tutorial couldn’t be completed if the mission was restarted. Mission “THE SURGEON” Fixed NPC not reacting to the player’s presence during the steal tutorial. Mission “THE SURGEON” Fixed optional objectives that could fail too easily. Mission “WELCOME TO BOSTON” When replaying the mission, when asked to buy a sword and pistol, those items would already be purchased. Mission “WELCOME TO BOSTON” Fixed Possible mission break if the player shoots the horse he’s supposed to ride. Mission “UNCONVINCED” Fixed a bug where the player could enter the tavern too early and break the mission. Mission “UNCONVINCED” Blocked accidental blending during the tavern fight, which could break the mission. Mission “FEATHERS AND TREES” Fixed a bug where the optional objective “Do not touch the ground” could fail too easily. Mission “HUNTING LESSONS” Fixed the issue where the bear could flee and eventually freeze. Mission “A BOORISH MAN” After the mission, the candelabra would display an interaction effect while the secret door to the basement was already opened. Mission “RIVER RESCUE” Blocked the player from diving in the river too early which could break the mission. Mission “STOP THE PRESSES” Cinematic could sometimes not trigger, breaking the mission. Mission “ON JOHNSON’S TRAIL” Fixed issue where Chapheau could become inactive if the player dragged the fight far from where it started. Mission “THE ANGRY CHEF” Fixed issue where the “limit health loss” optional objective would wrongly fail if the player reloads a checkpoint or dies. Also fix the displayed limit to 33% as that’s what’s actually used. Mission “FATHER AND SON” Fixed a bug where the guard you’re supposed to kill would not reappear if the player starts fighting him and then runs away. Mission “FATHER AND SON” The mission could not be completed if the guard the player kills the target he’s supposed to steal using a stealth kill from bench or a rope-dart hanging move. Mission “LEE’S LAST STAND” removed a destructible barrel that could cause problems if used as part of a contextual counter-attack. Boston Liberation Missions, North District Fixed an issue where some events would not complete properly if the player used an assassin recruit to kill the target. New York Liberation Missions Mission “PROTECT THE CLINIC”, fixed the mission not failing if the player goes too far from the area to protect. West District, fixed a bug where the NPCs guarding the infected blankets could sometimes not be there. Removed possibility to quit the bowls game after a reload, which would fail the mission. Mission “NORRIS GOES COURTING”, fixed a bug where Norris would not reappear if the player goes too far from him.